There’s no better way to upgrade your home’s interiors than with the addition of genuine hardwood flooring. Customers choose our local flooring store as their go-to source for a broad selection of sophisticated wood floors. Our flooring experts always keep your requirements in mind so you are sure to get the floors that best fit your needs in looks, performance, and price. We help you find a floor that complements your home, whether you prefer a traditional or modern aesthetic. You spend a lot of time in your home, creating memories with your loved ones throughout the years. Invest in your home with beautiful hardwood floors from our reputable flooring store. 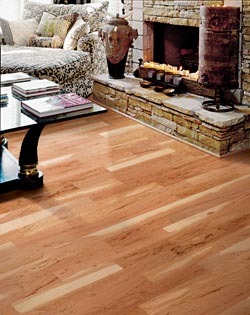 We are here to help you select a hardwood floor that elevates the appeal and value of your residential structure. From cherry and hickory, to maple and oak, we have just the right finish to complement your interiors. Once you’ve selected a floor, we’ll handle the hardwood flooring installation process for you. Solid Hardwood Flooring — Make a long-term investment with solid wood floors in Raleigh. Solid wood offers an unrivaled aesthetic that instantly adds class and refinement to any residential space. Floors can be refinished years later for a completely new aesthetic that restores that showroom sheen. Engineered Hardwood Flooring — When strength and durability matter, choose engineered wood floors in Raleigh. Constructed of multiple layers, engineered hardwood is designed to withstand moderate to heavy foot traffic. As with solid wood floors, engineered hardwood is available in an array of finishes, glosses, and styles. In addition to solid and engineered hardwood, our company also offers a range of other options, including bamboo and cork. The reason we offer all of these choices is simple; we want you to be satisfied with your purchase. In order for you to find the flooring choice of your dreams, we have to offer an outstanding flooring selection. That’s why we place such an emphasis on providing our customers with a wide variety of flooring products to browse. We believe that every homeowner deserves the chance to find his or her perfect floor. Get in touch with us today for more information regarding our large flooring selection. Don’t settle for a subpar contractor to install your brand-new hardwood flooring. Trust in our certified hardwood flooring installation professionals to properly remove your old floors and replace them with the hardwood floors of your choice. From smooth and glossy to rugged and matte, we make your interior design visions come to life. When you hire our company, you won’t have to worry about us doing the job halfway. Our trained flooring professionals deliver superior installation services and customer care on every job we take on. We take great pride in our work, at it shows in everything we do. After all, our customers are our greatest asset. We believe that hiring the right company to install your floors is essential to saving money and preventing headaches down the line. If an amateur contractor installs your floors improperly, they’ll have to be repaired and possibly replaced altogether. That’s why it’s so important that you hire an experienced and reliable company the first time. That level of expertise and dependability is exactly what our flooring professionals bring to the table on every job. If you’re in need of our installation services, please get in touch with us right away. We look forward to exceeding your expectations. Contact us when you need high-quality hardwood flooring. We serve our customers in Raleigh, Wake Forest, Rolesville, Youngsville, and Louisburg, North Carolina.